Home » Interviews » BCP Interview – Tom Parkinson-Morgan brings KILL SIX BILLION DEMONS to Image Comics! BCP Interview – Tom Parkinson-Morgan brings KILL SIX BILLION DEMONS to Image Comics! 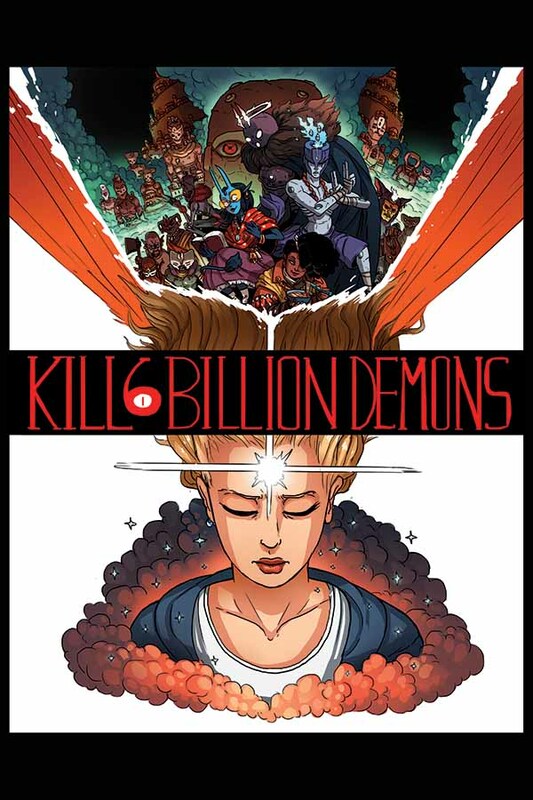 Image Comics recently announced their plans to release a printed first volume of the popular webcomic Kill Six Billion Demons, following on from their successes with similar projects like Meredith Gran’s Octopus Pie. 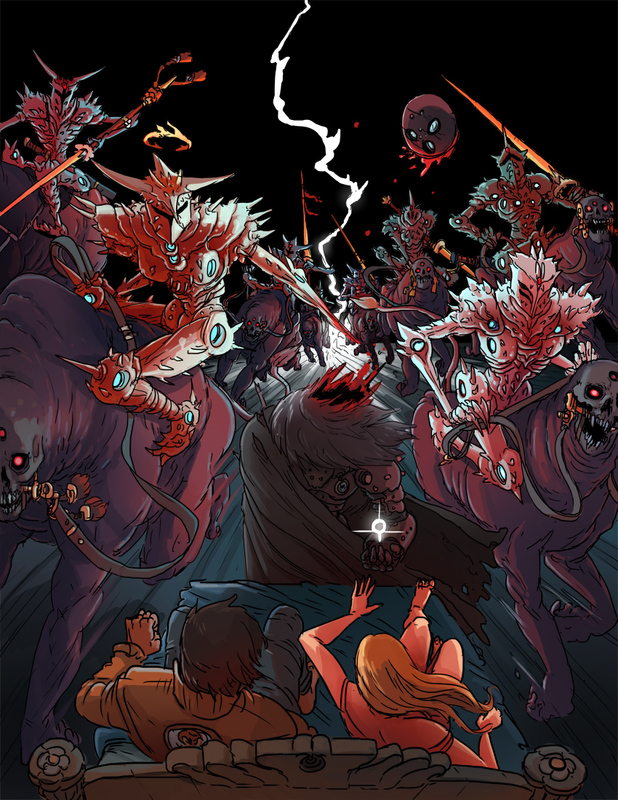 After taking a look at the first volume, which covers the first 90-odd pages of the webcomic, we instantly wanted to know more about this one, so were extremely fortunate to be able to sit down have a chat with the series creator Tom Parkinson-Morgan – AKA Abbadon – about how the series came about, and what new readers should expect from this boldly ambitious and fascinating series. 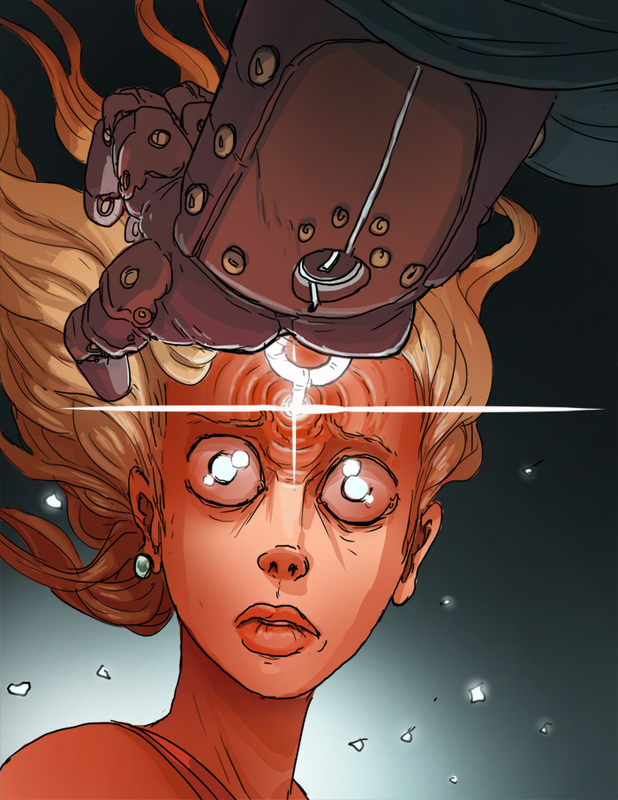 BIG COMIC PAGE: Firstly, for readers who may not be familiar with the series, can you give us a quick summary of the story behind Kill Six Billion Demons? I think that sums it up pretty well but obviously there’s more. There’s inter-dimensional gangsters and devils that speak in slang. There’s at least one kung fu angel. There’s a sphinx that shoots fire out of his mouth and eyes. There’s a whole city built out of petrified gods. And there’s definitely a key that can unlock the entire multiverse. All of this is in the comic by the way. I’m very proud of the kung-fu angels. BCP: Initially, what prompted you to go down the webcomic route rather than publishing digital or paper comics? TPM: I actually started doing comics online from the time I was about 16 (doing contests, posting work on deviantart, tumblr, and forums, that sort of thing). By the time I left university I felt like it was time I started a substantial finished project. I did actually start by trying to get my work noticed by publishers, through submissions and showing up at conventions. But that didn’t have a very high success rate – partly because I think publishers want to see that you have finished projects first before they take you on. I think it’s actually very hard to break into publishing without first finishing something substantial or at least having a following of some sorts. For some people, that might mean doing work in an anthology project, or a kickstarter book, or something similar. I think the easiest way, especially for me, is just to put work out online. The internet is fantastic because you can get your work directly to an extremely large audience, right away, with absolutely no intermediary steps. A webcomic is a totally self-driven project; one person can produce every aspect of it without any gatekeepers except for the ability to find hosting and a website (which is very easy with stuff like wordpress around). I didn’t actually start the webcomic with the intention of ever getting it published, but simply to work on a project that I know I could work on and finish on my own time schedule. Eventually that built up to where I am today, with 200+ full color comic pages finished, a book on the way from Image, and being supported by the fantastic fans over at Patreon to draw full time. Going from someone who largely considered themselves an amateur or hobbyist to what people would consider a professional comic artist with (what seems to me) very little of a transitional period has been a strange and transformative experience. I’ve turned into one of those people who is always encouraging people who aspire to a creative profession to finish work and put it out there (imagine that Shia Lebouf video of him standing in front a green screen telling you to ‘just do it’). BCP: One of the things that struck me from the first volume was the sheer scale of the world-building on display. What sort of inspirations have you drawn on in creating Throne and its inhabitants? TPM: A whole mess of stuff has gone into the comic. I think that my influences are pretty on my sleeve but I like to think I do at least a decent job of amalgamating them into something original. I’d say visually my biggest influences are French fantasy and sci-fi comics. It’s stereotypical to say but I’ve been hugely influenced by Jean ‘Moebius’ Giraud, who I would argue was one of the greatest men in comics. Other big inspirations are Hayao Miyazaki, Geof Darrow, the work of Wayne Barlowe, and a french fantasy comic called Requiem Chevalier Vampire drawn by Olivier Ledroit which is the most ridiculous over the top gothic mess I have ever read in my life and I love it. There’s a couple of manga staples I still read such as Berserk which I can say have definitely had an influence on me. BCP: The religious aspect of the story is very prevalent throughout, to the point where you’ve even written Psalms to support the mythology of the series. Was that an important aspect for you to include, and how did you go about crafting what is essentially your own religion? TPM: I read a lot of fantasy literature, and one of my favorite authors is Tad Williams, who does a great thing where he puts a little quote of some in-universe scripture or mythology at the beginning of each of his chapters. I think plenty of other authors do this, but Mr. Williams was the first author I’d read who did this and it blew me away, because it drew me so heavily into the world of the story, wondering what all these cryptic tidbits were about. I wanted to do something similar for my own comic. I had just finished reading the stuff Michael Kirkbride wrote for the Elder Scrolls series, which is amazingly written in how bizarre and incomprehensible it manages to be while still retaining some sense of mysticism and meaning. This got me into reading a lot about belief systems such as Hinduism, Taoism, or Buddhism, which he drew from, and also African syncretic religions such as Vodun which incorporate tiered concepts of God. I’m not a particularly religious person myself, but I’m very interested in religion, especially in the mythology, stories, and mystic parts of religious identity and history. Religion concerns itself with all kinds of interesting questions, such as the nature of time, consciousness, and the existence of paradox. We don’t think about it a lot, growing up in a Western Christian society, because Christianity seems so normalized, here, but Judeo-Christian mythology and mysticism is pretty great stuff as well. Old Testament angels are great examples of this (google that and you’ll see what I mean). The whole world of the comic came from a jokey idea where someone suggested I include Freidrich Nietzsche into the comic who famously said ‘God is dead’ (a completely misunderstood quote by the way). And I had the thought of ‘Well, what if I had a story where God actually was dead? And why? What happens to the place where He sat when making the universe?’ So from the start I thought religion would have to be a big part of the story, and I drew on all of the above to write the religious texts of the in-universe religion, called Atru, which is sort of like Buddhism/Taoism on steroids. BCP: How did the partnership with Image Comics to release printed copies of the series come about? TPM: My work was brought to the attention of Image by Brandon Graham, who is the author of the rebooted Prophet series, which is (in my humble opinion) one of the best if not the best sci-fi comics out there right now. I reached out to Brandon who was a fantastic mentor through the whole process and directed me to Eric Stephenson, who gave me the opportunity to put a book out. I’m very humbled that Image has chosen to publish me. BCP: What’s the plan for the printed releases moving forwards? How many volumes can readers expect to see published? TPM: The first book coming out is the first 92 pages of the comic, plus some of the religious text and a little extra art. There are over 200 pages of the comic coming out online, and I can’t say anything definite yet, but I hope to publish another volume next year with Image about the same time that will be about 120 pages (the work is just about finished). If all goes according to plan, there will be maybe 5-6 volumes total. Regardless, the whole thing will be finished online. You don’t start a multi-year project like this without intent to finish it off. BCP: You’ve been publishing KSBD for over three years now, and have presumably improved and honed your artistic abilities a lot during that time. Was there ever any temptation to go back and re-draw any of the older pages that you might not have been happy with? TPM: In fact, my terrible secret is that I’ve already done this. The first 24 pages of the comic or so were originally in black and white, and the art quality was far lower since I spent less time per page. I went back and re-drew big chunks of them and added color only because I knew the book would possibly get printed as early as a year ago. I don’t think the temptation is that strong to re-draw any of the newer pages only because the main reason I did it originally was for consistency’s sake. BCP: One of the particularly interesting things I found about the webcomic is the way that you allow the readers to potentially shape the storyline direction via the site’s “submit” feature. How much of an impact has that feature had on the story to this point? TPM: A little bit, and mainly just the beginning of the story. I realized that reader-driven stories can only work in certain formats. Long-form graphic novels are not one of them. But I do like to open certain elements to user input when I have large blank spaces to fill. For example, I needed a bunch of mercenaries that would chase the main character throughout the comic. I didn’t have any specific designs in mind for them, nor would specific designs matter to the story. So I opened it up to reader ideas. The result is most of the names and some of the appearances of these characters were reader-submitted, which is pretty cool. They’ve shown up a whole bunch in the comic so far, mostly in the fight scenes. In the future I’m doing this again for a gang of devils in the next book. BCP: For the webcomic, do you have an ending in mind for the story, or are you happy for it to keep running as long as you have ideas in your head? TPM: I absolutely have an ending in mind, and I’m one of those people who cannot start work without a clear ending in mind. Well written stories in my opinion have an arc, and that arc must bend towards something. BCP: And finally, what would you say to any readers who may be on the fence about this title to help convince them to pick up the first volume? TPM: If the phrase ‘kung fu angel’ does not intrigue you I am clearly not working hard enough. BCP: Thanks so much for your time, Tom. KILL SIX BILLION DEMONS Volume 1 TP goes on sale September 7th 2016 from Image Comics. Make sure to check out the official KSBD website – and webcomic – by CLICKING HERE.